**Thanks y’all for your encouragement and compliments on the site. If you still can’t see the new design from your computer you may need to “clear your browser cache” (basically removing your computer’s memory of where you’ve been on the Internet). Let me know if you are still having issues! Have you noticed all the commentary and opinions about the new “The Bible” mini-series (on the History Channel)? Whether positive or negative…people are talking about the Bible (which is pretty awesome). One predominant criticism relates to what details/stories the writers chose to include (& leave out). The reality is (just like with any book-to-movie scenario) there’s no way for the producers to include every detail from the Bible in a few hours of television. My hope is this series instills curiosity and motivates viewers to study the Scriptures further. For me, the more I study God’s Living, True Word and the more details I learn and connections I see, the more powerful the big story of God’s redemptive plan becomes. Learning context, studying word roots and reading the Old Testament prophecies not only deepens my faith, but helps me tell the stories better to my boys and deepens their faith. For example, learning Shadrach, Meshach & Abednego didn’t even “smell” like smoke (Daniel 3:27) after they came out of the fiery furnace was a pretty awesome testimony of God’s power (and a really fun fact to share with the boys) . Symbolic animal- Donkeys were known to symbolize humility, peace and Davidic royalty (1 Kings 1:33). Jesus rode into Jerusalem, in the fashion of a King…specifically King David. 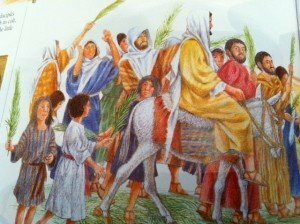 The crowds shouted, “Hosanna to the Son of David! Blessed is he who comes in the name of the Lord! 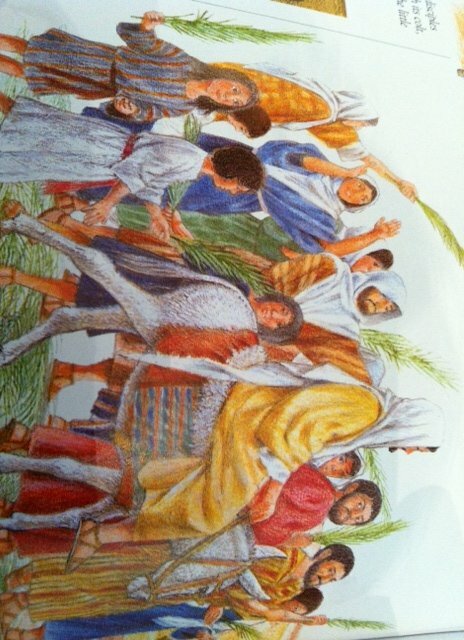 Hosanna in the highest!” (Matthew 21:9/ Psalm 118:25). When Jesus entered Jerusalem they asked, “Who is this?” and the crowds still didn’t recognize him as the fulfillment of prophecy. Instead they answered, “Jesus, the prophet from Nazareth.” (vs 11). It may seem odd to have Jesus ask about himself, but “Christ” was the Greek word for the Hebrew “Messiah”. The Pharisees had studied & memorized the Old Testament. They knew what to look for while waiting for “the Christ” or “the Messiah”. So they gave the gold star answer: the Messiah would be “the Son of David”. How is it then that David, speaking by the Spirit, calls him (Messiah) ‘Lord’? For he says, ‘The Lord said to my Lord; Sit at my right hand until I put your enemies under your feet.’ If then David calls him ‘Lord’, how can he be his son? (Matthew 22:43-45). Basically, in Psalm 110:1, David refers to the Messiah as “my Lord” and quotes a conversation between God & the Messiah. Jesus used the text the Pharisees were familiar with to prove David acknowledged the Messiah to be more than a man, one who would sit at the right hand of God. And the religious people fell silent. And dared not ask any more questions. Fully human & Fully God. Son of David & Son of God. King of Kings & Lord of Lords. Who do you claim Him to be? What details about the Passion week story have you learned recently? 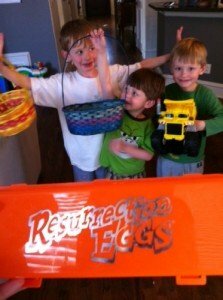 **If you are looking for a way to share the fulfillment of Messianic prophecies with your children, the Lifeway resurrection eggs are a great tool. We went through ours today. I hid the 12 eggs in the backyard…each boy was allowed to find 4 eggs. Since I knew the boys would be a little disappointed the eggs didn’t have candy, as we opened each egg and talked about the significance of the contents…we each ate a Starburst jelly bean (addicting, much?). Afterward even the three-year-old asked to do it again! Wow Lauren what an awesome story. Love how God can use the willing for His purposes. I definitely want to make sure I see all the episodes so I know what conversations to have with people…demonstrating His love & story of redemption. What an interesting detail…the Lamb who was slain entered Jerusalem with the passover lambs…God is in the details. Sometimes I’m amazed the Jews missed “God with us”…but then I realize I miss Him so often in my own day.